Who are the Rowdy Rooters? In the past few years the amount of fans going to sporting events has declined enormously. In the glory years of Terrace basketball the amount of fans going to games was overwhelming, it was always the place to be. The fans were loud, crazy, and supportive, something that has been lacking from recent years. Three students at Terrace noticed this absence of spirit and decided they’ve had enough. Jeremy Ansdell, Adam Lorraine, and Trevor Swanson have always been proud to be the most spirited in the Class of 2017. Since Rowdy Rooters was started there has always been a group of people every year that try to lead cheers and spread positivity and spirit. In the last few years there just hasn’t been those leaders until Ansdell, Lorraine and Swanson stepped up. 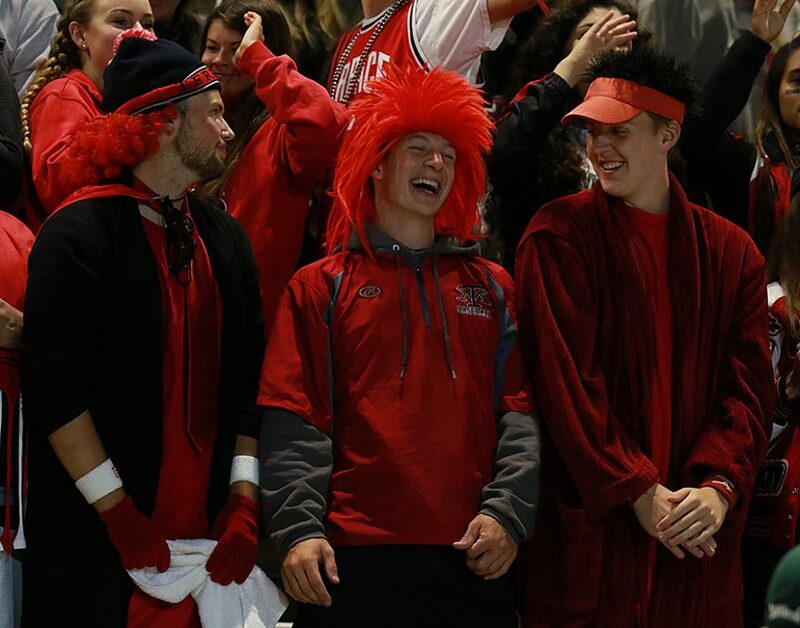 Not only have these three friends kickstarted Rowdy Rooters again, they have made it a club available to anyone who wants to help make Terrace a more positive and spirited environment. To learn more about the decision behind starting it up again, they were asked a few questions. How did Rowdy Rooters start? The first time I saw Rowdy Rooters was in my freshman year with a group of seniors like ourselves. Past them though I don’t know the history of Rowdy Rooters and how it started or if they were the first. I know it wasn’t a club back then, it was just a group of 4 to 5 guys. Why has Rowdy Rooters died down in the past few years? After our freshman year there were only two seniors in the class of 2015 that decided to be Rowdy Rooters and they didn’t even go to anything after football. After that with the class of 2016 there were no Rowdy Rooters and our school had no spirit. So after our freshman year the numbers of Rowdy Rooters just declined which caused our school to just be less spirited. Why did you decide to start Rowdy Rooters again? We noticed a decline of spirit last year and we hated it. I especially noticed during my time as Hurkey being in front of the crowd. No one really got hyped last year and our attendance to the games was just sad. So that ‘s when we decided we needed to step in and start Rowdy Rooters again so we could get this school’s spirit back on track. What exactly do the Rowdy Rooters do? The Rowdy Rooters are just a group of people that mainly go to sporting events to get people hyped in the crowd so we can have an awesome fan section. The thing we did different this year was make Rowdy Rooters an actual club so so we can get more people involved. We know that just us 3 can’t get everyone to the games and not everyone can hear us from the front row so we wanted to get people from all classes at terrace to try and get the most amount of people involved as we can. With people from different classes in Rowdy Rooters we have more people at school telling their friends to go to the game and we have more people at the games helping us cheer from maybe the 4th or 5th row so that other people will follow them. That’s the way we’re trying to get Rowdy Rooters going this year. What motivates you to stay so spirited? Being spirited is one of the fun things for me when it comes to high school. Everyone knows high school can get rough sometimes with all the stress we get from tests and all the sleep we lose with homework. Sporting events and assemblies are times where you can drop all those worries about school and just come together as a group and get hyped. Another big thing is the support that I think our sport teams need. Nothing feels better than seeing the smile on a player’s face when I go up to them after their game and give them a high five, whether they won or lost. With a crowd any team will feel better and it might even make them play better so that’s why I think our sports teams deserve our support. What other clubs/activities are you involved in? 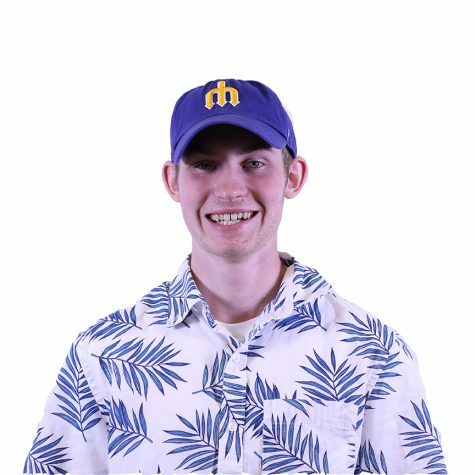 Other than Rowdy Rooters, I’m a public relations officer for DECA, I’m a co-president of our school’s smash club, and I’m also in Honors Society. I also played for the tennis team this year and last year. How do students at MTHS get involved in Rowdy Rooters? Any student is welcome to join Rowdy Rooters. We usually have meetings on Wednesdays after school at 2:00 in the HUB. We will usually have an announcement on HBN so they should keep an eye out for that. If they have any questions they should try to stop us in the halls or see us at lunch so we can help them out. I think It died down simply because people didn’t care enough about what was going on with Terrace sports. For the past few years there was no one to really lead the school. [Our] freshman year we had leaders like Jack Pierce and Wyatt Alleman. We wanted to bring that hype back like they did for our freshman year. Also so that it continues [to be] a tradition when we leave. The Rowdy Rooters basically try to go to as many events as they can and organize the theme. We also hold events such as tailgates prior to football games where we have a bunch of people come out and have some food and fun before a football game. We have a Twitter account that says when and where an event is and what kind of theme we are going to wear. I think It’s the fact that our school is becoming more united and people are going out of their comfort zones to come to the games makes me very excited and more spirited. We like when kids get more involved because it makes us feel like we’ve made a positive impact in our school. I am involved in Tennis, Baseball, TATU, Link Crew, ASB, Rocketry, and DECA. Anyone [can be] a Rowdy Rooter. We will let the school know when we will have meetings. These meetings involve ideas for themes and certain activities we should do such as tailgates. We will also have T-shirt order forms for anyone who wants to join. Rowdy Rooters was started actually by a senior project a few years back and we decided to try and revive the tradition [at] terrace. I think Rowdy Rooters started to die down because of kids of our generation being so busy with activities. This makes it hard to have supporting our teams a priority. But I’m really happy with the turnout we’ve had this year. We decided to start up Rowdy Rooters again because it’s our last year and cheering is something we all love to do. We thought it was important to bring back a sense of community in terrace to create a more positive environment at the school. That’s the legacy we’re trying to leave behind, a place where everybody cares for one another. 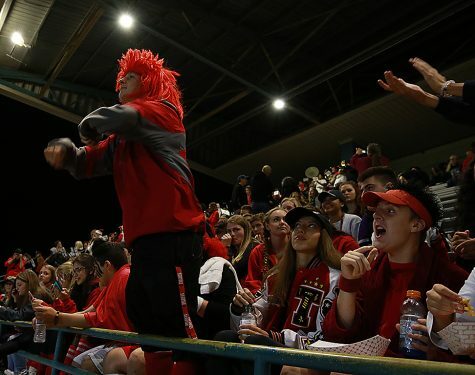 The Rowdy Rooters are a group of students that support the different clubs, sports and extracurriculars around terrace. We’re dedicated to being inclusive and welcome to all! What motivates me to stay so spirited is seeing all the fun times we’ve had as a group in the past and wanting to make more memories. I’m involved in TATU, tennis, ASB and Link Crew. Anybody can get involved in Rowdy Rooters! You can talk to Adam, Trevor, or I in the halls or come to our meetings after school in the HUB that we’ll be making announcements for on HBN.